keeping the cover on more in case too much sunlight was the problem. Finally, I contacted the nice people at Water’s Choice, where I buy my natural enzymes. The smoke is so thick that it is blurring the trees across the street. Tom Vaughn, co-owner of Water’s Choice with his wife Debbie, gives excellent best customer service. He not only called me back right away, but he knew what to test and what to do with the results. 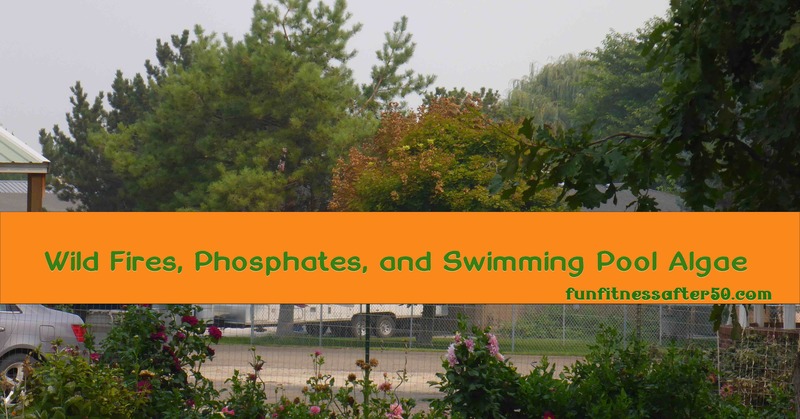 Since there has been heavy smoke in the air from wild fires, the swimming pool water had probably absorbed phosphates from the smoke. How does that happen? The fires burn lots of organic matter, which has phosphates in it. This releases phosphates into the air. To top it off, phosphates are a main ingredient in fire retardants. Stuff in the air, like phosphates in this case, gets absorbed into the water. Algae likes to eat phosphates. When algae has food, it grow and multiples. Fortunately for me, I live just 30 minutes from Water’s Choice. Instead of having to wait 2-3 days for something to arrive in the mail, I drove over there the next day and they did the phosphate test for me. My water phosphate levels were between 500 – 1000. That was on the HIGH end of the scale. If phosphates had not shown up as high, he had two other tests in mind, but this was clear results. 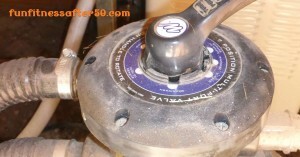 The pool filter has been set on by-pass so that the water skips the filter and goes straight to the heater for 24 hours. I also swam the next day and was so pleased to see the algae was gone! It was not only gone from the smooth sides of the vinyl liner, it was gone from the nooks and crannies of the ladder and the current generator. The water was barely cloudy, supposedly from the phosphate remover binding with the phosphates. After the filter was run for a day, it cleared up. The water is blue the next day! Life being what it is, I didn’t get around to testing the phosphates again after 48 hours, like I had been advised to. I did however test it 5 days later. Since the smoke from wild fires had increased dramatically over the last few days, I wasn’t surprised that the phosphates measured as between 300-500. I had looked at the colors during the first test, so I did have some comparison experience to help me evaluate what I was seeing. Mr. Vaughn had recommended I purchase 2 ounces of phosphate remover since my phosphates had been so high to begin with, so I began the cycle of treatment again. The algae were only just beginning to grow this time, and the results were just as dramatic. The pool was clean again. I was naturally wary of using any chlorine after my skin issues. Mr. Vaughn pointed out that a couple of tablespoons of chlorine would dissipate quickly. I already knew that the potassium shock I had been using wasn’t making a dent in the algae, so I decided to give it a try. The worst case scenario was that if I had a bit of skin reaction, I would need to stay out of my pool for a day while the chlorine broke down. I am happy to say that I never had any reaction. Is having a swimming pool worth it? It is true that problem solving can be a little stressful, especially as a new swimming pool owner. However, I have been able to learn what I need to over these past few years and I am now less intimidated by problems with my swimming pool. I have loved being able to swim year-round, right out my back door, and in a pool that is as clean as I can keep it. Swimming pools are often built in the warm months, when you might not be thinking of potential winter use or realize what that would involve. But especially, a smaller exercise pool can be reasonably set up for winter use. If you want to use your swimming pool year round and you have any sort of freezing winter, you need to think ahead. Preferably you will think ahead while building or installing it, but if you didn’t there might still be some things you can do! Have a temporary tent to put over it. Either intense cold or heavy precipitation can greatly inhibit your enjoyment of or access to your outdoor swimming pool. We have used a portable garage to cover my swimming pool for several winters now. It makes a huge difference to have that for the harshest months. It does mean that we need to put it up before the weather gets too bad, though. Make sure you have a way to put water into the pool when outside faucets are either turned off or frozen. For me, that means keeping a hose in my greenhouse so that the water doesn’t freeze inside of it. There are ways to attach hoses to indoor faucets, but beware of trying to use a hose with your water heater to put in hot water. Hoses are not made to withstand such temperatures and may burst, flooding the associated region of the house. Have a well functioning swimming pool water heater. I suppose it is technically possible to set up some sort of solar water heating in the winter, but I haven’t seen anything that impresses me. You don’t want the pipes to your swimming pool freezing. Go ahead and turn that heater up a couple of degrees. It is one thing to get into cool water when it is above 80°F and sunny outside. It is discouraging to do so in the cold wet weather. Just a raising my swimming pools temperature to 82° (from the 80°F that I had been keeping it) made it so much more comfortable for winter swimming. 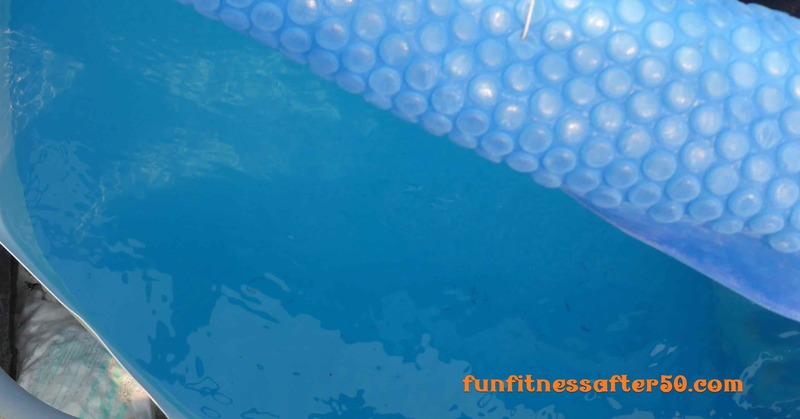 Have an insulating cover directly on top of the water while the swimming pool is not in use. This will help keep energy costs down. Consider how the swimming pool cover will be opened and closed with the temporary tent in place. The tent may obstruct access to things that are not obvious at first. Make sure your core body temperature is on the warm side before swimming. I like to do this while inside the house, so that the walk to the pool isn’t painful from the lower winter temperatures or cutting winds. Have a path to your pool that is comparatively easy to maintain during snow or wind. Even if you have a covered walkway, there is likely to be blowing of snow or debris. That will be easiest to remove if the path is firm and level, such as a concrete walk. This is also important for keeping doors into the pool area functional. Make sure you still have good access to all the swimming pool machinery, such as heater and filter. I find that during the winter the water stays cleaner, but it still occasionally needs to be backwashed to keep the filter working and water flowing through the heater. Appropriately protect the heater and filter from extremes of temperature and weather. My husband built this insulated lean-to shed against the garage and it has worked wonderfully! 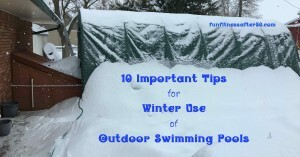 Here is a very short video showing how I get water to my pool in spite of heavy snowfalls. I have thoroughly enjoyed being able to swim just out my back door no matter what the weather. Even if the roads are dangerous or impassable, I get to swim. The time crunch for originally building the equipment housing meant the sides were left as long, removable panels. They were heavy and awkward for me, so I often needed help to deal with them. 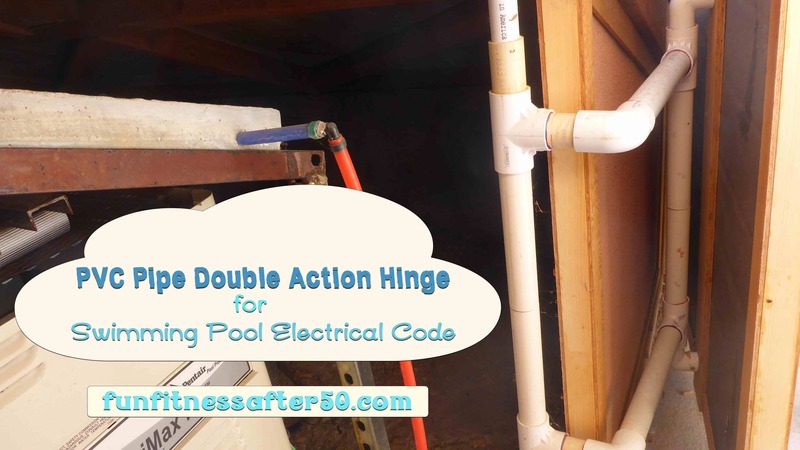 As explained more fully in the video (below), my husband-engineer custom designed a double action PVC pipe hinge to solve the problem. I predict you will want your own PVC pipe hinge somewhere after you watch! He talks about the comparable PVC pipe sizes in the video. There was minimal gluing involved, specifically at the elbow joints. You can tell from the purple outline. 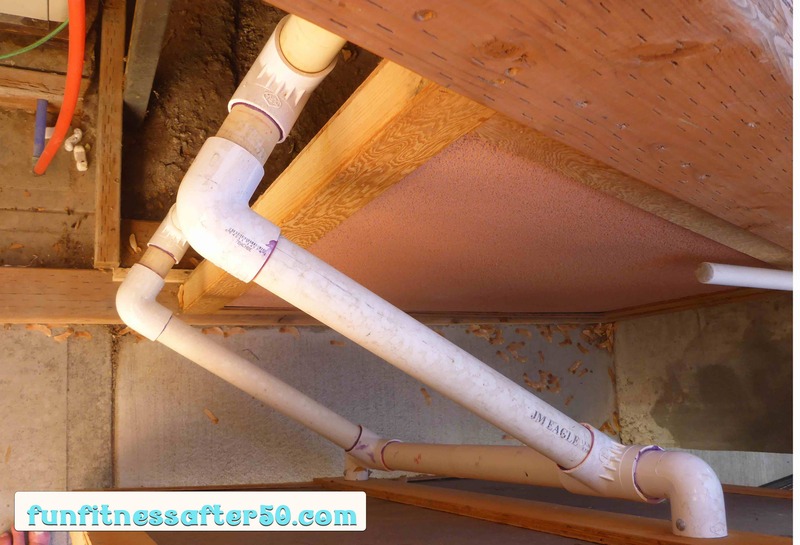 But even I have glued PVC pipe, so I know it is easily learned. If you have any questions regarding the hinge construction, please ask in the blog or video comments. Happy hinge making! This is looking down at the hinge from over the top of the door, when it is part way open and to the side. Honestly, I wasn’t shopping for another bikini. Not just yet. But I saw a certain one when helping buy a swimsuit for my daughter and I knew it was worth trying. I have used it many times now and it is the new favorite for workout swims in my Endless Pools Fastlane current generator in a 9×17 Tuff Pool. Wearing the best active bikini of 2016 and getting into my pool for a workout. As I have said in the past, I think swimming against the current is a real test of an active bikini, especially the top. This top passes with flying colors. It does not catch water at all and it stays perfectly in place with all movement. It is not the standard triangle shape that I usually prefer, particularly for post-swim tanning, but it is a cute design. The cups are slightly gathered at the outer edges, near the arm. The scoop neckline combined with the keyhole cut-out in the center allow it to have the advantages of sports bra stability, but the visual appeal of maintaining a feminine shape. The cross-straps on the back of the top are continuous with the front of the top. There is nothing to tie. Some tops like this are confusing to put on, but I have not had any issues with this one. The straps are somewhat narrower than last year’s favorite by TYR, but the elastic was well chosen for staying put without cutting in. Getting the top off is the hardest thing about it. It is hard to beat the easy removal of untying something, but with this one there is the advantage of not needing to find the most comfortable secure tension every time I put it on either, so it is a very reasonable exchange. I bought myself a medium, having wider than average shoulders for a woman, in spite of my small bust. It fits quite well. My daughter needed a larger one, and reported that it also stayed in place quite well when she is swimming. She swims about twice the amount of time I do and at a faster current adjustment, so the design seems uniquely suited for various cup sizes. The fabric is about 50% polyester, so it should last longer than spandex suits, but it is softer and more malleable than the 90% polyester suits I have worn. This makes it very comfortable next to the skin, as well as comfortable to be in because it is form fitting rather than form squashing. Since it is supposed to last a long time in chlorine, it should last an extra long time in my natural enzyme swimming pool. My only complaint about this suit is that it is not available in more colors! I do like my turquoise, but would also like some pretty prints, especially for the top. The only print top available was sold out after I got it for my daughter. This will definitely be one of the swim suits that I take on our tropical vacations this coming cold season! Swimming is the oddest mix of natural and unnatural of any sport I know of. On one hand, a person needs to get almost completely naked or at least get very streamlined. 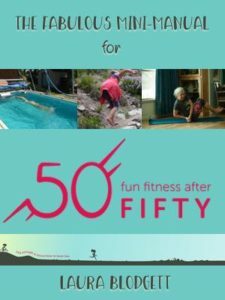 And while the human body may not have the optimum shape, appendages, and motion dynamics for water movement, most bodies are capable of some combination of floating and gliding that makes swimming useful. There is the inconvenient inability to breathe under water, but balance and rhythm can overcome this significantly. In my experience, the biggest challenge is seeing where one is going. Whether it be in a chlorinated pool, a natural body of water, or my own naturally sanitized swimming pool. I don’t like water on my eyeballs. Either the chemicals, the dirt, the temperature of the water, or just the pressure of the water are beyond unappealing to me. So I have tried quite a few goggles over my 20 year history of swimming several times a week. I have had some decent ones, but up until now, I have never had one that combined comfort and function to the level of these goggles. 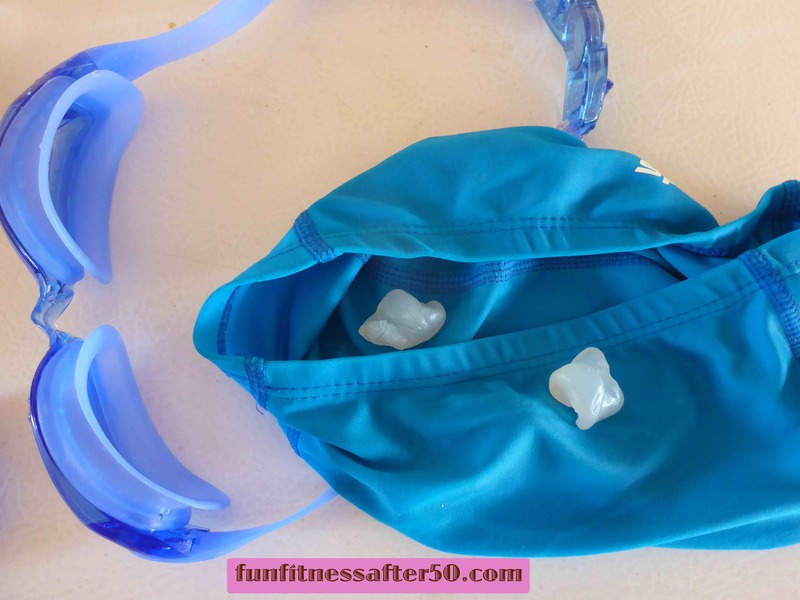 The white blobs are the silicone ear plugs minutes after a swim. I have already mashed them together a bit, as that is a reflexive thing to do when they are in my hands! 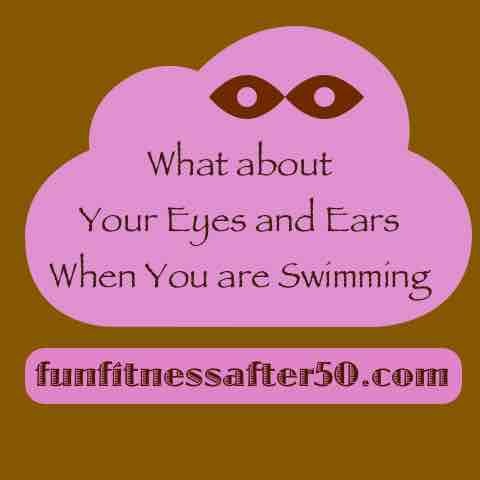 Water in the ears is only a problem for me intermittently, but when it is, it is highly uncomfortable. A friend introduced me to moldable silicone ear plugs. (Don’t be confused. These are NOT the earplugs that come with the goggles as a bonus.) Admittedly, I have never worn any other ear plugs swimming, because when I have used regular, above water earplugs, I really didn’t like the pressure on my ears. Yeah, I know. I’m like the princess and the pea. But he convinced me to try these and I have used them a few times now. 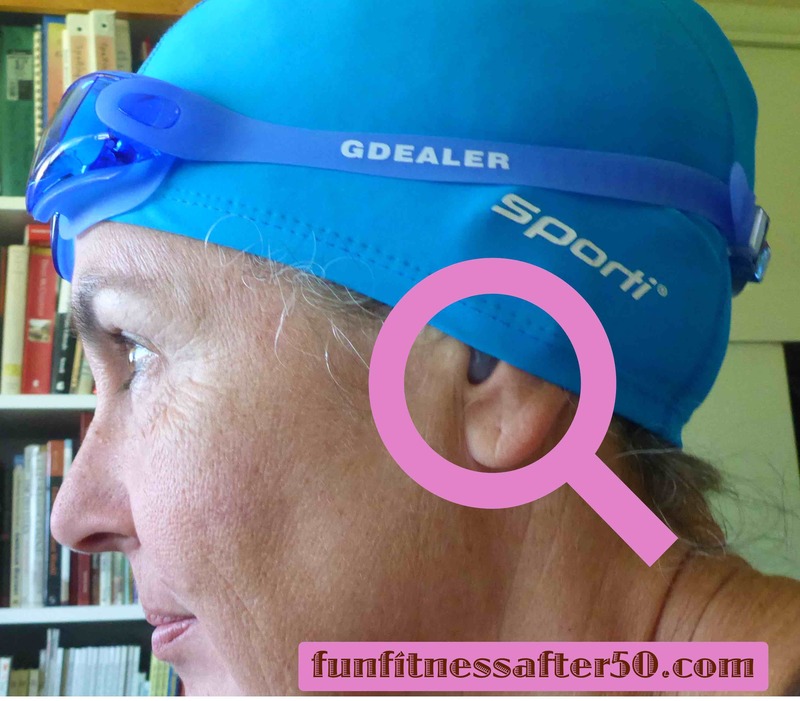 You can barely see the silicone ear plugs in my ears, part way under the swim cap. To use them, you mold a part of the silicone to fit comfortably in the outer ear canal. I’m sure I can get better at this, but what I have been doing has worked. Then, the rest of the silicone can be pressed into the outer ear spaces, working it a bit into the curves to help hold it in place. 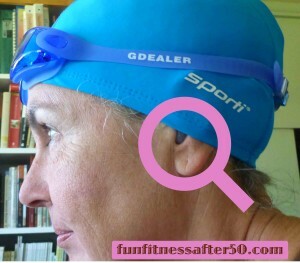 My swim cap tends to go part way over them, as well, and then the goggles are holding the swim cap down. My friend does not wear a swim cap and he has worn his pair of ear plugs so long that they are yellowed. Getting them out was a bit freaky the first time. It was hard to tell if they were going to come apart and leave pieces in my ear, but they didn’t. I ended up grasping them around the base of the long section that was inserted, then pulling gently until suction was released and all came sliding out. There was a small issue with some hair sticking into one of them, but that was pulled out without hurting me. That is the same basic method I have used all the other times, too. Having these two improvements in my swimming gear has made it possible for me to relax more thoroughly when swimming. I should remind you that I am swimming against a machine generated current, so if the earplugs stay in and the goggles don’t take on water in those conditions, they should be very good in a regular swimming pool situation for sure. I am tempted to stock up on them. Me, swimming in my Fastlane generated current with these goggles and ear plugs. The look on my face may make you think I am trying hard, but I am actually quite relaxed. Just timing my air intake.